Ah, the colors of spring: dainty pink, baby blue, creamy yellow, and…black? 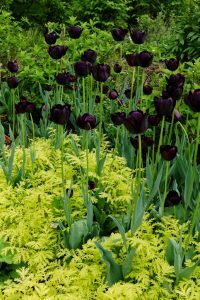 Though black flowers may not seem to fit the whole pastel palette of the early garden, there’s no reason to wait until summer to enjoy their moody beauty. 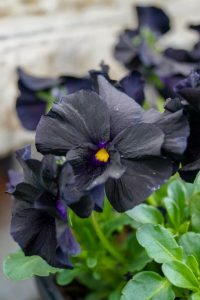 Some of the most exquisite black blooms are available only in spring! First, there are the Lenten roses (Helleborus x hybridus). 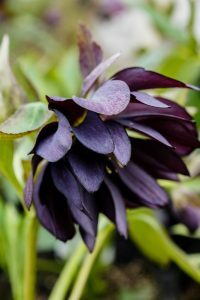 Recent advances in hellebore breeding have brought out some truly outstanding options for black-flower aficionados, from singles like ‘New York Night’ to doubles such as ‘Dark and Handsome’ and ‘Midnight Ruffles’. 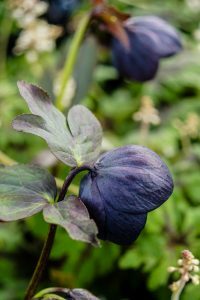 Granted, “black” in hellebores can range from deep gray-purples to deepest burgundy, so it’s smart to see the plants in bloom for yourself if you’re particular about what counts as black to you. We still have some of these beauties in stock, but they’re going fast; come out and take a look! For seriously black spring flowers, the violas are where it’s at. The slightly ruffly blooms of ‘Blackout’ are among our favorites. Tuck them into a container so you can admire them up close, or plant a drift of them by your door as an antidote to an excess of soft spring colors. 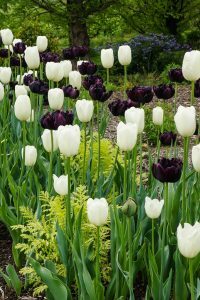 If you’re a regular spring visitor to Linden Hill, you’ll know that Jerry loves to use black tulips, such as single ‘Queen of Night’ or double ‘Black Hero’, in the Formal Garden. Sometimes he pairs them with white for a classic look. 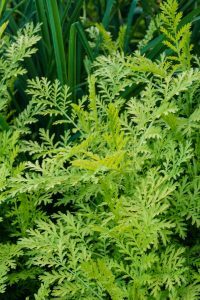 Other years, he goes for a simple but high-contrast combo with the ferny, bright yellow foliage of ‘Isla Gold’ tansy (Tanacetum vulgare). 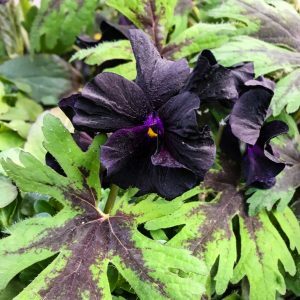 It’s too late to plant black tulips for a show this year, but we do have ‘Isla Gold’ tansy in stock right now, and it’s an excellent partner for black hellebores and violas as well. 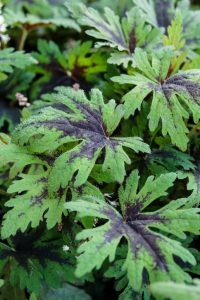 Its bright, feathery foliage looks lovely with pretty much any color, in fact, and it’s an early riser, so you can always count on it for spring combinations. Another companion that pairs perfectly with black spring flowers is the foamflower (Tiarella). Many of them have a dark splash or veining pattern in their leaves, which creates an elegant echo for dark blossoms. Below is hybrid ‘Timbuktu’. Remember, Linden Hill Gardens is now open every day of the week, from 10 am to 6 pm, for your spring shopping convenience. Whether you’re intrigued by the idea of black flowers or looking for lots of bright blooms to celebrate the return of warmer weather, we have you covered. New plants are arriving daily, so there’s always something different to see!